Our Diabetic Life: He's still around. I don’t know how to explain how I know this occurred. But when my eyes fluttered open Saturday morning a big smile spread across my face and I knew. It’s all part of a string of events too miraculous not to chronicle. The night before I was knelling by my bed praying for peace and for strength to get through the next day. M would be graduating High School and his father wouldn’t be there to hug him, and to celebrate this huge milestone he worked so hard for. It was 11:30 pm, so I got up to check the boys’ blood sugars and then slid into my cool sheets ready for a good nights sleep. I have learned to listen to that voice, as it has always steered me somewhere wonderful. I grabbed the book, "Proof of Heaven," and sleepily began reading where I had left off months ago. It was good. It was interesting. But I wasn’t getting any specific messages that I felt were just for me. After an hour of reading I laid it down on the bed and closed my eyes. I opened it up and scanned the next couple chapters. More of the same. But I felt inclined to skip to the end, so I did. I read the last chapter…nothing. I read the second to last chapter. Nothing. Again I set the book down and closed my eyes. So I opened it to Chapter 35, and in an instant I found out why I needed to read that book in that very moment. There was a poem by a man named David M. Romano. Here it is in its entirety. The tears came fiercely, and freely. I had to read it twice because the first time I could barely see as I read. I turned the light off, held the book to my chest and fell asleep. The next morning Ryan kissed me awake. I clicked the link and there in front of me was Ryan smiling widely. These videos that I haven’t seen for over 10 years were ready for me to view instantly. I hurried to the living room and called the boys. We spent the entire morning watching our family. Watching Ryan kiss and love his babies. Watching our babies’ first steps. Watching us all together. Needless to say, we were late getting ready for M’s graduation. We all showered and rushed to get dressed. M had to leave early, so I walked him out to the car and gave him a big hug. As M got into his car, J came running out of the house with my laptop in his hands. I don’t know why Heavenly Father keeps sending me miracles. I always find a way to doubt them…to convince myself that it’s all just coincidences. But Saturday, I knew. I KNEW that Ryan was with us. I will not question it anymore. My heart is just warmed! What a wonderful gift to all of you. I'm so glad that you all enjoyed the day. Congratulations M!!!!!!!!!!!!!!! How could anyone not be around for you and your boys Meri? I hope you know I"m not being flip when I say this: you are remarkable, inspirational, funny, kind, brave, silly, smart, giving, motherly, wicked in a good way, strong, awesome. All the heaven celebrates you. So of course Ryan is ordered to check in on you regularly! I'm sitting at my desk, crying. Congratulations M!! Congratulations Merri, you are blessed!! Bravo M! Meri what a beautiful post to share with us, I believe that our loved ones are still here, too...there are just those perfectly timed moments that show it clearly. Of all your beautiful posts, this is one of the most beautiful. I love your family. Of course he was there. Wow! This is beautiful and so heart warming! Your family is amazing! 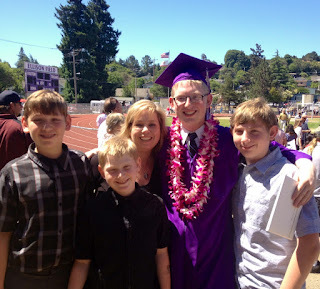 Congratualtions to M, high school graduation is a huge part in life!